Witnessing the birth of stars would require a telescope larger in diameter than many cities. Say hello to ALMA. Light from the setting sun dances on antennas forming part of the Atacama Large Millimeter/submillimeter Array (ALMA), high in Chile’s Atacama Desert. ON A MAY MORNING two pickup trucks passed through the quiet town of San Pedro in Chile’s Atacama Desert and headed up a mountainside on a dirt road. It was 1994, and the five men inside the trucks were on a peculiar quest: to find the highest, driest, flattest place on the planet. They had already spent a week and a half scouting other locations in the Atacama, one on the Argentine side of the desert. Now, guided by a map obtained from the Chilean military by one of the men, a Chilean astronomer named Hernán Quintana, they were searching for a route up to the Chajnantor plateau--at 16,400 feet, almost as high as the two base camps serving climbers on Mount Everest. With the Andes Mountains forming a barrier to clouds gathering above the Amazon to the east, and the winds from the Pacific to the west picking up little moisture as they pass over the cold Peru Current (formerly called the Humboldt Current), the Atacama Desert is known to be among the driest places on Earth, with less than a half inch of rain a year on average. The desert’s remoteness and inhospitably thin, dry air—ideal for observing the night sky—had already lured several large, multinational telescope projects. For the most part, these were designed to view the fraction of the cosmos visible at optical wavelengths—the portion of the light spectrum that the human eye can see. Quintana and his companions were scouting a location for a different kind of telescope, one designed to penetrate the curtains of dust and gas that shroud galaxies, swirl around stars, and stretch through the expanses of interstellar space. The project would require some 20 years and more than a billion dollars to design and build. First, however, they had to find the right spot. As the last of 25 North American antennas rolls toward a docking pad, the world’s largest—and at $1.3 billion, costliest—ground-based telescope nears readiness. The joint American, European, and Japanese project will map unseen cosmic regions with unprecedented clarity. OBJECTS IN THE UNIVERSE radiate energy in various wavelengths, depending on how hot or cold they are. Exploding supernovae, for instance, are extremely hot; in addition to emitting visible light equal to that of billions of suns, they release shortwave, high-energy x-rays and gamma rays, detectable by specialized telescopes such as NASA’s­ space-based Chandra X-ray Observatory. Toward the opposite, colder end of the spectrum are comets and asteroids, which shed infrared wavelengths longer than what our eyes and our optical telescopes can see. Much of the universe is colder still. The clouds of dust and gas from which stars are made are only slightly warmer than absolute zero—the temperature at which atoms come to a standstill. The birth of planets occurs in similar settings, seeded by fragments of dust and gas that clump together within the swirling fog that rotates around newly born stars. In the 1960s astronomers attempting to penetrate this “cold universe” quickly realized how challenging it was to use ground-based antennas to detect wavelengths in the millimeter and submillimeter range, even longer than infrared. Their first problem was how to cope with a gigantic amount of static. Unlike visible light, which travels through the planet’s atmosphere without much interference, millimeter and submillimeter waves are absorbed and distorted by water vapor, which emits radiation in the same band of the spectrum, adding earthly noise to waves arriving from the heavens. Millimeter and submillimeter waves also carry far less energy than visible light does, producing a weak signal even in a radio dish with an enormous collecting area. The solution scientists came up with was to arrange several antennas in an array on a site with very dry air, combining their signals so that they functioned together as a single telescope. By the 1980s several small arrays were operating in Japan, France, and in the United States, in Hawaii and California. Soon technological advances made it possible to contemplate a far larger radio array, an enormous lens with vastly more resolving power—­provided a site could be found that was high and flat enough to expand the distance between antennas to whole miles. And if the dishes were portable, the distance between them could be adjusted to change the sensitivity of the telescope to reveal fine detail. Placed far apart, they could zoom in to focus on a small target such as a disk of dust around a star. Bunching the antennas together would have the effect of zooming out, which would be useful for imaging large objects such as a galaxy. Searching for an ideal setting for such a telescope, research groups from Europe, Japan, and the U.S. converged on the Atacama Desert. HERNÁN QUINTANA, who had pored over the military maps of the desert for weeks before the expedition in the spring of 1994, suspected that only the high ground above San Pedro de Atacama would satisfy all the requirements. But it wasn’t easy to get to. “The trip was slow and painful, because the tires kept getting stuck in sand,” remembers Riccardo Giovanelli of Cornell University, who accompanied Quintana, along with Angel Otárola from the European Southern Observatory (ESO) and Paul Vanden Bout and Robert Brown from the National Radio Astronomy Observatory (NRAO). Halfway up the road from San Pedro, Vanden Bout and Otárola’s truck broke down. The others made it to the top of the Jama Pass. “The sky was beautiful—it was the deepest blue one can expect to see,” Giovanelli says. One of the astronomers had brought along an instrument to measure water vapor. The volume of vapor in the air was lower than the group had ever encountered anywhere. “There was no doubt in anybody’s mind that somewhere nearby was the place,” Giovanelli says. A short time later, on a second scouting trip, Brown found the actual site, a wide, expansive plateau at the bottom of Cerro Chajnantor, a nearby peak. It was soon clear to all three international parties that by joining forces they could build a single array far more powerful than any one of them could alone. In 1999 the National Science Foundation and the ESO signed an agreement to work together. They settled on a plan to contribute 32 antennas apiece, each 12 meters in diameter, or about 40 feet. The Japanese agreed to provide 16 more antennas in a complementary array. Thus began an almost two-decade effort to transform one of the world’s loneliest spots into a bustling modern observatory. Land mines planted decades before by the Chilean military to deter incursions from Bolivia to the north had to be located and removed. Protracted negotiations were needed to persuade an oil company that was planning to run a pipeline through the site to reroute it. Prototype antennas were redesigned after testing in New Mexico. Costs mounted. Quarrels were joined and resolved. The NRAO and ESO couldn’t agree on a single antenna design, in part because each side wanted to support manufacturers on its own shores; in the end they chose two designs and two suppliers for their share of the antennas, reduced to 25 from each of the agencies. Then there was the little town of San Pedro, which had just two telephone lines and a single gas station. “We had to assemble a little city on the mountainside in the middle of nowhere,” says the NRAO’s Al Wootten, the lead North American scientist on the project. The first of the antennas—weighing more than a hundred tons—arrived from the U.S. at the Chilean port of Antofagasta in April 2007. Escorted by a convoy of police cars, a truck hauled the gigantic dish up the mountain, its progress occasionally interrupted by herds of llamas being shepherded across the road. Over the next five years the dishes continued to arrive. Set­ting them up to work collectively as a single telescope required astonishing precision. They would need to swivel together on command and point at the same target in the sky within a second and a half of one another. To merge their signals coherently, a massive supercomputer had to be installed on-site that was capable of adjusting, to within the width of a human hair, the distance the signals traveled through a cable from the antennas to the processing center—while compensating for the expansion and contraction of the cable due to temperature fluctuations. ALMA is designed to penetrate the curtains of dust and gas that shroud galaxies, swirl around stars, and stretch through the expanses of interstellar space. With the familiar Large Magellanic Cloud (at top center) beckoning in the sky above, six of the giant dishes forming the Atacama Large Millimeter/submillimeter Array (ALMA) stand by. ALMA’s gigantic eye is able to see deep into the early universe, when stars and galaxies were first forming billions of years ago. ON A BRIGHT APRIL MORNING a panoramic view of the plateau offers a striking juxtaposition of the ancient and the modern. The brown expanse is studded with white dishes that look tiny against the sky’s limitless azure backdrop. Up close, each of the 12-meter antennas towers above the ground, the dish’s surface glinting in the sun. Operated remotely from a base camp, they swivel gracefully in unison at the click of a button, belying their massive weight. Two custom-­made­ 28-wheel transporters, nicknamed Otto and Lore, stand ready to move them to new locations on the plateau as needed. By the time it was officially inaugurated in March 2013, the Atacama Large Millimeter/submillimeter Array—ALMA—had already begun to deliver on expectations. 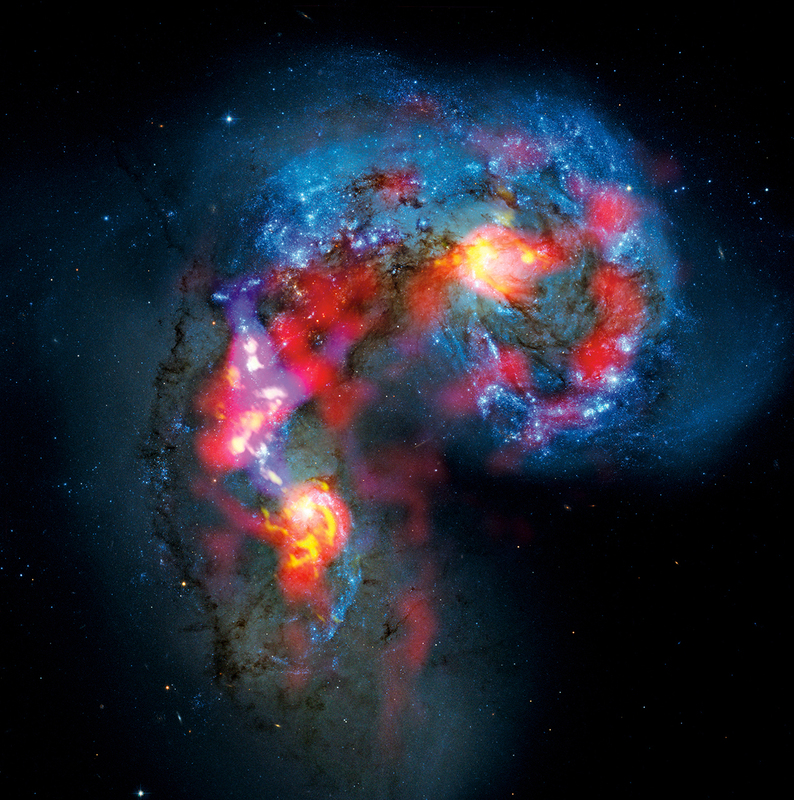 The year before, with only 16 antennas in operation, researchers led by Caltech’s Joaquin Vieira had peered through ALMA at 26 distant galaxies showing bursts of star formation. They were surprised to find that the galaxies were on average as far as 11.7 billion light-years away, meaning that their star production had been under way when the universe was barely two billion years old. Such frenetic star birth had previously been thought to have begun at least a billion years later. Since ALMA’s inauguration, there has been a steady stream of other discoveries. In July 2013 astronomers reported that the telescope's observations had helped solve a long-standing puzzle: why massive galaxies are so rare in the universe. ALMA’s high-resolution images of the nearby Sculptor galaxy showed cold, dense gas billowing out from the center of the galactic disk. Astronomers concluded that the gas was being blasted out by winds from newly formed stars, a huge loss of starmaking material that could stymie the galaxy’s future growth. If confirmed in other galaxies, the phenomenon could solve the mystery. True to its promise, ALMA is also helping researchers understand how planets are born. Last year they reported on ALMA’s images of a disk of dust circling a young star—a nursery of planets. The images revealed what appeared to be a dust trap within the disk: a sheltered region where little grains of dust could stick to one another and, grain by grain, grow large enough to seed a planet. This was the first ever glimpse into the start of the planet-forming process. These observations are just the beginning. When all of the antennas come on line later this year, ALMA will conjure even finer details of galaxies and star systems. On an arid plateau a few miles from where shepherds once slept, our eyes will open upon an unseen universe. This is Yudhijit Bhattacharjee’s first story for National Geographic. Dave Yoder photographed Florence’s Duomo for the February issue. Read how breaking research has confirmed the early universe's explosive first fraction of a second. Tune in to the National Geographic Channel on Mondays for the weekly series Cosmos: A SpaceTime Odyssey.